In 1967, undercover police officer Ray Wood (aka Ray Woodall) testified during congressional hearings before the Committee on Un-American Activities. As part of an investigation into 'subversive influences in riots, looting and burning', he gave testimony against East River CORE chairman Blyden Jackson as being a communist. Jackson had always been an admitted socialist but sources close to him also state he may have actually been a communist. As proof, they point to the fact he was the campaign manager for Herbert Aptheker when he ran for Congress in 1966. Aptheker was a well known intellectual and member of the Communist Party. Wood's testimony can be seen by clicking on the links below. The photo was part of the evidence given against Jackson during the hearings. 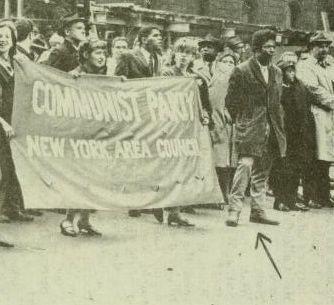 The arrow points to him walking in a demonstration march with members of the Communist Party. The full picture can be seen by clicking on the link below the image. 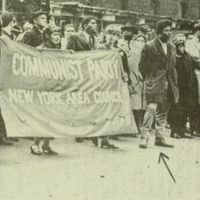 U.S. Government Printing Office, “testimony against East River CORE chairman Blyden Jackson by Ray Wood and photo of Jackson at Communist March,” corenyc.org, accessed April 21, 2019, http://www.corenyc.org/omeka/items/show/120.